Camp attendees expanded their cultural knowledge at the Education building. Chinese is the world’s most widely used language today, according to Ethnologue’s online database, spoken by nearly two billion people. Five million people in North America and South America speak Chinese. 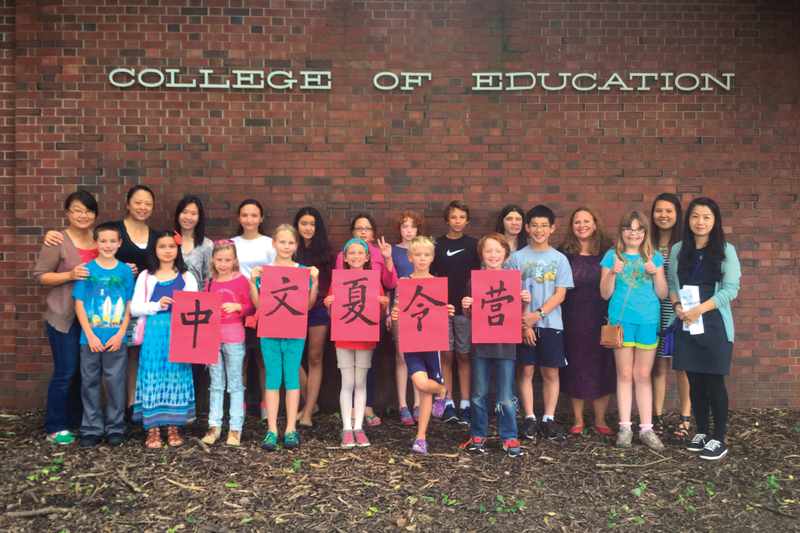 With those numbers in mind, the Chinese Culture and Language Camp held on the University of Illinois at Urbana-Champaign campus last July provided a new generation of children opportunities to learn Chinese. Wei Liu, the global education specialist in the College of Education at Illinois, said the five-day camp was part of the college’s efforts to promote international outreach – but there was a local objective, as well. “We’re trying to let the (area) schools and students know that the Office of International Programs has many different community projects going on, and this is just one of them,” she said. 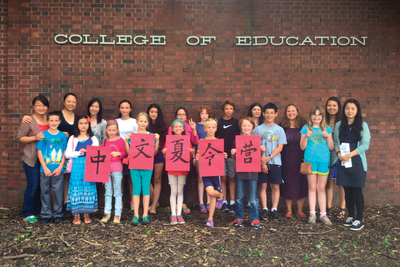 The camp came to fruition following a visit to China by Education at Illinois Dean Mary Kalantzis and professor William Cope, who were interested in learning more about a Chinese language program created by Betty Chan, director of Yew Chung International School. After observing Chan’s curriculum in practice, Kalantzis and Cope envisioned the language camp as a way to bring Chan’s language program to area students. Camp sessions for the fourth- through eighth-graders were packed with language learning, cultural activities and learning on the Scholar platform. 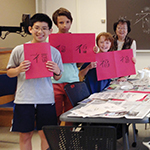 Scholar provided an interactive Web-writing space in which camp attendees researched topics ranging from Chinese culture to Chinese inventions. The children then wrote short papers to share with peers and others in the online community. “While we review everything every day, there’s still new stuff every day. So it never gets old,” said Lucas Wood, 12, who attends Countryside School in Champaign. Many of the students had very basic Chinese language skills, or none at all. Accordingly, master teacher Zoe Wang divided the attendees into three groups and revised her lesson plans nightly to accommodate those levels. Wang’s teaching focused on the utilitarian aspects of language: Students made introductions, stated their age, and discussed their family, nationality and interests. She used slides that showed both Chinese characters and pictures. Though the camp didn’t cover Chinese writing, the slides provided a way to connect the pictures with their accompanying characters. “If they know how to say it, then they can try to memorize the Chinese characters or be familiar with them, at least,” Wang said. Elementary education student Katie Yan said the majority of the camp kids arrived not knowing how to say “hello” in Chinese. Only a few spoke the language at home. Still, like Wang, she adapted her lessons to their skill levels and personalities, eventually noticing progress. Her activities included a papier-mâché dragon project, making a Peking opera mask, Chinese paper cutting, recall exercises, and an activity in which students created terra cotta warriors. One fifth-grader took things to a higher “engineering” level in the terra cotta project, making a warrior bobble head. “That always amazes me … having some brief guidelines, but then letting them take control of their project,” Yan said. Martial arts and cooking lessons took place on campus at the Activities and Recreation Center, with the cooking classes coming in handy for the camp’s culminating event – ordering food and drinks in Chinese from a Campustown restaurant. “In terms of planning, scheduling and the overall experience for the kids, I think it all worked out really well,” Liu said.